When planning a prom event, the most important thing to determine is the theme. This will help figure out what colors are going to be used for prom, the type of decorations that are going to be used and what kind of favors are going to be given out. Another aspect of prom that is very important to decide is where the prom is going to be held. This is important since it helps the people planning see how much money they can work with after the cost of the hotel. It also helps them see how much they can decorate the venue since different hotels have different policies. Lastly, it helps decide what kind of food and desert will be served. The people planning the prom also need to decide who they are going to use as ushers. This is very important since they help direct people to their seats and help check people in. The Juniors are the ones who help plan the prom in honor of the seniors each year. They work hard each year to help plan the prom and make sure that it is the best prom possible for the seniors. Hallie, a junior, says that some of the challenges when planning the event were getting in contact with the different businesses such as the DJ’s, and photo booths. She also says that planning the prom was not the easiest but with the help of her advisors, it made the process a lot easier. There are all different types of groups who go to Prom. There are some people decide to go stag meaning that they go alone without a date and other people decide to go as a group with friends. There are of course the traditional couples as well. It doesn’t matter who you go with to Prom or whether or not you go with others. The key is to have fun and enjoy yourself no matter what. For those who do decide to go with a date, there are many different ways that people ask others to the Prom. Some people ask their date with a simple text if they are just going as friends. They find that this is fine since they are just friends and don’t care as much. Others ask in person with just a simple gesture saying “Prom?”. This type of gesture is very nice and simple with getting the task done. There are also people who go all out and do a big Promposal for their date. This is normally done only for couples but anyone can do it if they want to. It isn’t necessary at all to do but some people like to go all out and big with their invitations. 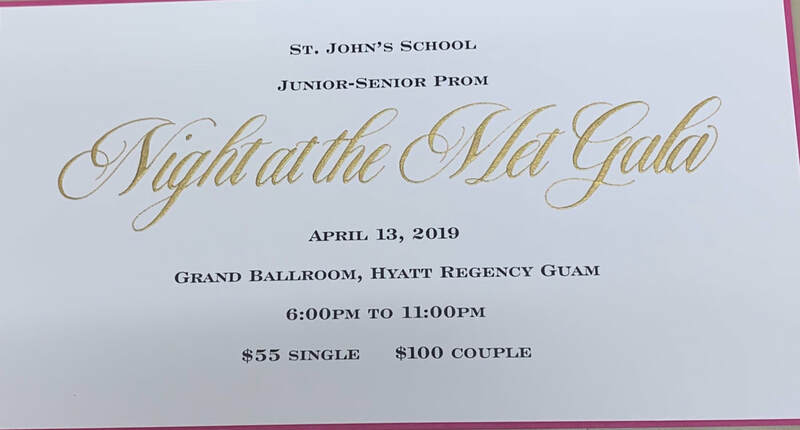 For this year’s prom, we were very fortunate to have our invitation and prom ticket designed by Ms. Emily Gallardo. She is the teacher of Mrs. Ellen Petra. Each of the invitations and prom tickets have parts of it that are handwritten. This is very special and hard to get. There is a lot of work goes into setting up a prom. The tables need to be decorated with the tablecloths and table settings. The food area also needs to be set up with the different types of food and desert. The dj needs to set up their music equipment and the photo booth people also need to set up their equipment. Also, if there is a candy bar, the different candies need to be placed with their containers in an area.